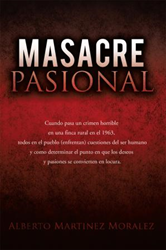 Alberto Martinez Morales’s new book presented in Spanish, Masacre Pasional, ($12.99, paperback, 9781498418812; $6.99, e-book, 9781498418829) tells the story of a horrible crime that occurs in a country estate in 1963. Everyone in town faces issues of human beings and how to determine the point at which desires and passions become insane. In the plot of the novel, the writer makes an uplifting investigation of scientific and biblical character. The defense of the murder is done according to the Bible and according to science, maintaining the reader concentrated in their lecture, with great interest from beginning to end. Alberto Martinez Morales is a lawyer – a title that was given from the law faculty of the University of Cartagena, Colombia, with the degree of Doctor in Political Science and Law Faculty. He has been a Municipal judge, First and Second Associate’s judge of the Criminal and Labour court of Justice in Cartagena. Professor in the University of Cartagena, as a Professor of Public and Private International Law, and at the University Jorge Tadeo Lozano, he served as a Professor of Law at the faculty of foreign trade. He is a Professor of History in Colombian and Spanish grammar and a Theologian. Xulon Press, a division of Salem Media Group, is the world’s largest Christian self-publisher, with more than 15,000 titles published to date. Retailers may order Masacre Pasional through Ingram Book Company and/or Spring Arbor Book Distributors. The book is available online through xulonpress.com/bookstore, amazon.com, and barnesandnoble.com.